Most often, the time you'll spend on the Transactions will be spent categorizing using the quick list view or the new Transaction Details View. 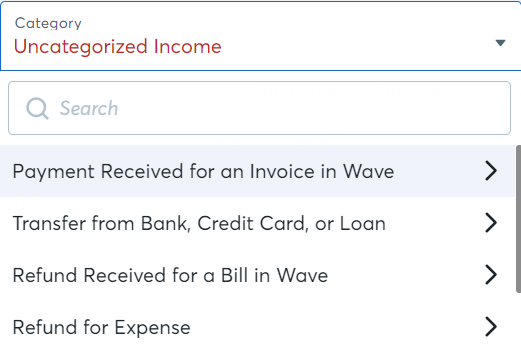 This detail view expands when you add a new transaction or select an existing one. If you’ve previously used the Transactions page, you may already be familiar with the process of adding and categorizing your transactions. Things look a little bit different now, but the process is the same. As you add transactions, you’ll enter the date, description, amount, account, and category. You may notice that transactions are no longer labeled as either income or expense, but now are either deposit or withdrawal. We changed the language to clarify what is actually occurring: your money is either entering or leaving an account. As an example, previously you might have recorded a refund as a negative income transaction. In your upgraded transactions page, this would instead be best entered as a withdrawal categorized as a refund. You’ll see a few new options when adding a category. For any withdrawal transactions, there will be four pre-populated options for categorization above a list of the rest of your accounts. Selecting the Bill Payment option will bring up a list of your unpaid or partially paid bills to which you can apply the transaction. Selecting Refund Sent for an Invoice in Wave will call up a list of your paid or partially paid invoices to which a refund can be applied. Selecting this option will link the transaction to the invoice, and you will see it on the Invoices page. Refund for Income will bring up a list of income accounts to which any income has been recorded so that the income from any previous transactions can be offset by the refund transaction. If the withdrawal transaction you have entered does not fall under the four categories you see here, then it can be categorized to any of the other accounts that you see in the drop-down. 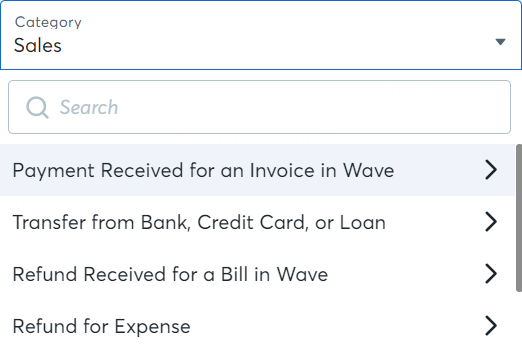 Selecting Payment Received for an Invoice in Wave will allow you to indicate that the transaction is a payment for an unpaid or partially paid Wave invoice. Refund Received for a Bill in Wave will call up a list of any of the bills for which you have recorded a payment. Recording a refund will mark the bill as unpaid by the amount of the transaction. Selecting Refund for Expense will populate a list of accounts to which expenses have already been recorded. Selecting the account to which the original expense was recorded will offset the expense account by the deposit amount. Just as with withdrawals, if none of the four categories above apply to the transaction in question, it can be categorized using any of the accounts that appear in the drop-down below the options we’ve just reviewed. Another new addition is the Save button you’ll see in the transaction details view. This will confirm any details you enter or modify. When you hover your cursor over the Review checkmark, you’ll see a message that says Save and Mark as Reviewed. That's it! You are now a master of transaction categorization.